These are incredibly easy to make, but will wow your guests, for sure. A rich vanilla-scented, creamy coconut center is enrobed in dark chocolate sprinkled with pink salt, for a dessert that’s suitable for everyone at the table (whether they are vegan, vegetarian, paleo, or just hungry). 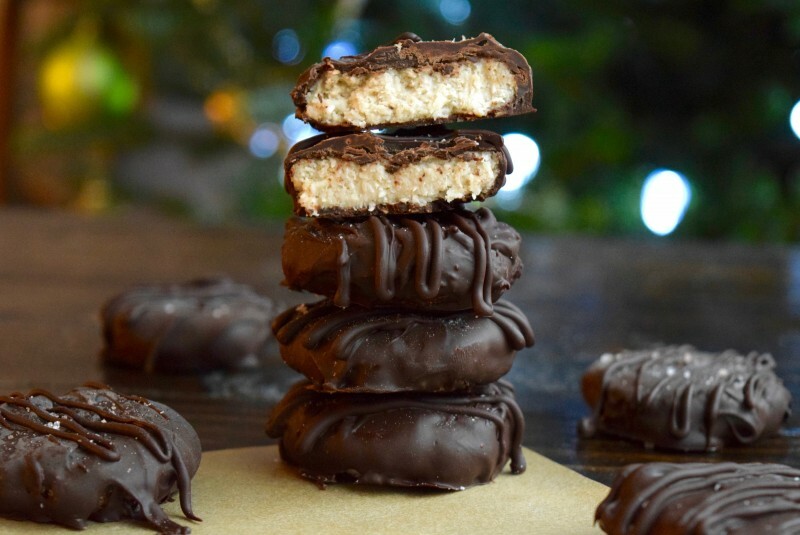 I bet you’ll want to make these healthy Christmas cookies way after the season is over. 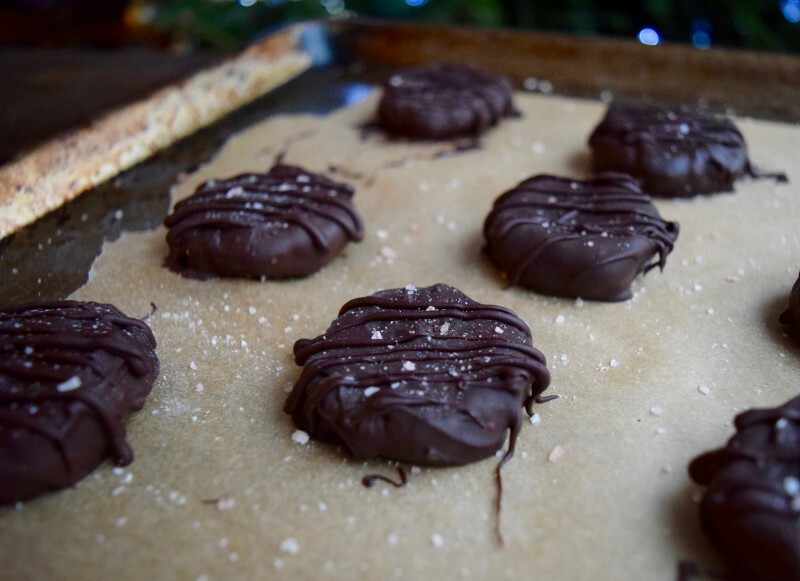 And if you want to round out your Healthy Christmas Cookie spread, consider these Paleo Sugar Cookies, too. Add shredded coconut to a blender, and process until it becomes a fine powder, about 30-60 seconds. Add the remaining cookie ingredients, and blend until a dough forms. If it is too dry, add more coconut milk, 1 teaspoon at a time, until a dough forms. Use a spoon to scoop out about 10 evenly sized balls, and then press them into a round, flat cookie shape. Place them on a parchment lined baking sheet, and freeze for at least 15 minutes, to firm up. Once cookies are firm, using a double boiler, melt the chocolate chips. Use two forks to dip each cookie into the chocolate, carefully scrape off any excess, and then return to the sheet. Repeat with remaining cookies. You should have a little chocolate left. 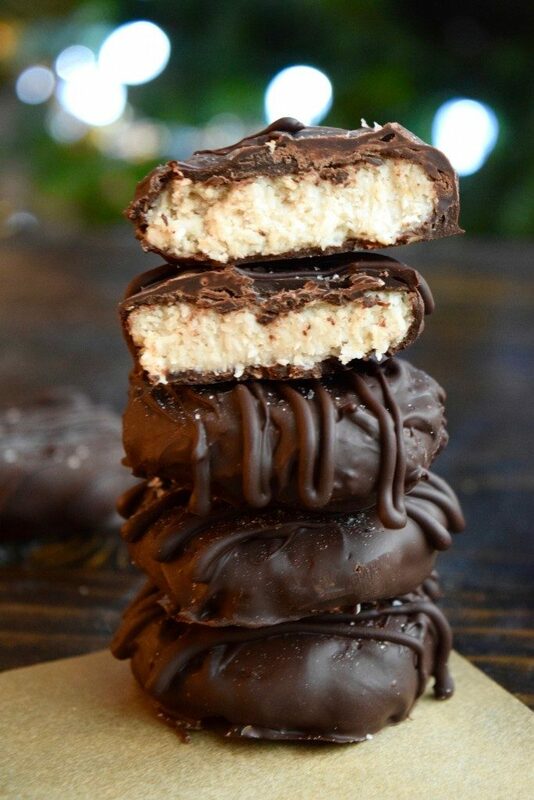 You can put it in a pastry bag and drizzle the chocolate over the cookies like shown in the photo, if desired. Grind a little bit of pink salt over the cookies. Refrigerate or freeze to firm up.